Grosset & Dunlap, 9781524785925, 14pp. Tiny Bible Tales, a new series of board books, shares the stories of the Bible's bravest heroes. 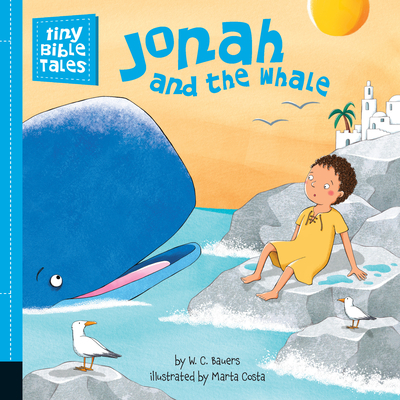 With gentle, rhyming text, this book tells the tale of Jonah getting swallowed by the great whale. And with illustrations depicting these heroic Biblical characters as children, readers can easily put themselves directly in the story. Help the people to obey. After Jonah sets sail against God's command, he finds himself in the belly of a great whale. Trapped there for three days and three nights, he learns a valuable lesson in forgiveness. Born in Barcelona in 1970, Marta studied Graphic Design in the ELISAVA School of Barcelona. In 2005, she started her own company for design, serigraphy, and the commercialization of t-shirts and other products for children, on which she could set down her illustrations. Since 2007, she has worked as a freelance illustrator, working mostly for publishing companies in Spain (Casals, Barcanova, Grupo SM, Bruño, Teide). Most recently, she has illustrated Penguin Young Reader's Noah's Ark.